I sometimes get odd looks from passers-by when I am standing looking at some building that probably seems at best unremarkable to them. Several times, walking around the centre of Launceston contemplating shop fronts, banks, pubs, backs of houses, and similar sights, I was aware of quizzical looks. I wasn’t long in the town (the chief architectural object of my visit to Cornwall was to see some country churches), but as well as walking around I seized the opportunity to pause and sit in the Square and see how much had changed since the John Piper illustration and photograph I posted some years ago. One object of my gaze hadn’t changed much at all: this building, done in Victorian Gothic and dominating one corner of the Square. Details such as the rows of pointed arches and the occasional quatrefoils reminded me a little of the sort of architecture that Osbert Lancaster poked gentle fun at in his exemplary cartoon histories of architecture: his ‘Municipal Gothic’ just about fitted the bill. 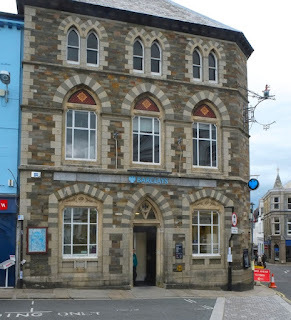 This isn’t a municipal building but a bank, and the 1870s or 1880s Gothic, the work of the somewhat Gothically named Launceston architect Otho Bathurst Peter, seems to fit the bill well. Both the banded, two-colour stone of the arches (showing the influence of Ruskin’s studies of Venetian building no doubt) and the multi-coloured stone of the walls are satisfying. I like this masonry, the restrained ornament (those quatrefoils above the door and the ground-floor windows) and the simple, plain-speaking way the building turns the corner. I spent a while taking all this in, puzzling away at the colourful decoration above the middle row of windows. It’s tiled, I think, although if so the tiles are laid very close, so that the joins are hard to see. As I looked, and waited for the traffic to pass so that I could take a relatively uncluttered photograph, a passing woman caught my eye. ‘Yes, it’s rather good, isn’t it?’ she said, with an approving nod. Which is true, and shows me that not all these passing glances are quizzical. It was a long time ago. An open door seemed to promise cool shade that hot summer. I remember the silence. The streets outside, with their endless tiny terraced houses, were quiet too, the ironworks silent, and the canal and boatyard nearby inactive. I think I recall a lingering smell of incense. I'm sure I remember the light and the dark – bits of painting and gilding gleamed and pale arches shone between a dark floor and brown roof timbers high above those arches and above tall windows. I remember rows of saints and the sense that this was something different – different from the run of austere nonconformist chapels and whitewashed Anglican churches I'd experienced, more colourful and lively than the pale pointed arches of cathedrals like Salisbury and Winchester that I'd been admiring not long before. I remember thinking that these round arches were somehow distinct from the ones (Norman) that I'd previously seen in parish churches. 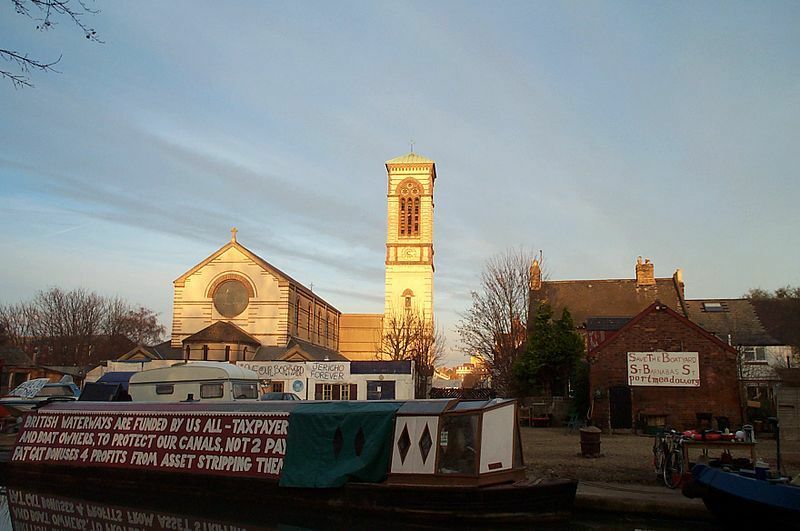 I'd not been to Italy yet, but I knew what a campanile was and that the tower of this church resembled one: square, tall, narrow, large-windowed, roofed with a pyramid. Italy. Yes, that must be what was behind this cavernous, apse-ended space with its rows of saints and its altar canopy and its rather dark east end, where hanging things and candlesticks and the pinnacles of the altar canopy glowed in the gloom. Passing St Barnabas, Oxford, again the other day, I was delighted to find that the neighbourhood was still almost silent and that the door was open – the cleaners were finishing their work and gave me a few minutes to look again at this glowing interior while they finished and packed up their mops and brooms. Sir Arthur Blomfield’s Romanesque basilica of 1869–72 is almost exactly as I remember it from the 1970s, except that the dark floor has been renewed with paler material. 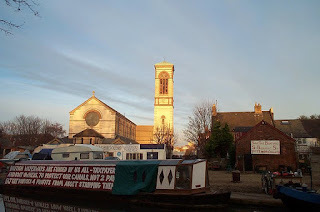 There are still mosaics of saints and prophets to admire, a glorious painted and gilded pulpit, and proportions that recall the churches of Ravenna, a place I’ve visited twice since I first encountered St Barnabas. But the details of this Oxford church, such as the artfully shaped tiles that make up the mosaics above the arcades, are English, and all its own. A David with long, string-plucking fingers, a St John the Baptist with eyes that (with apologies to the ghosts of Peter Cook and Dudley Moore) seem to follow one round the room, tussocky ground, and a scaly, layered palm tree trunk. 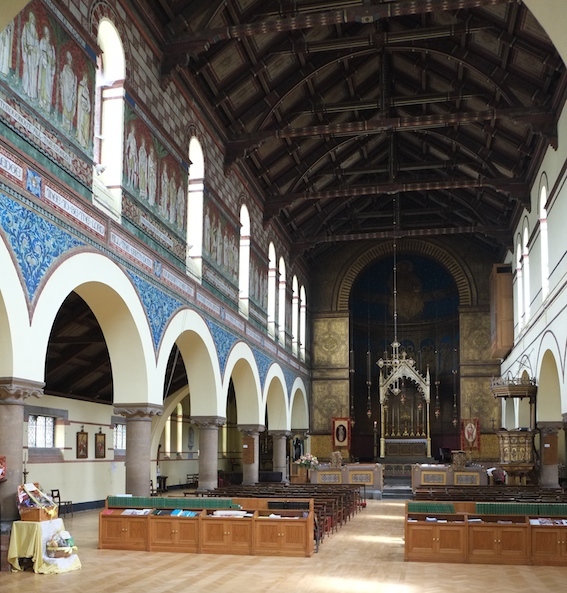 Here’s to St Barnabas, jewel of the Romanesque revival, Italianate oasis, citadel of quiet. Approached via the canopied entrance front on the left of my first photograph, the Town Museum and Public Rooms in Bodmin is a fairly standard piece of late-Victorian free Gothic verging on Elizabethan revival: rather plain mullioned windows, tall chimneys, shields. But the long side elevation is something else: inventive and so full of interesting details that it’s easy to forget that this is essentially a symmetrical frontage (a gable at either end, a row of five big windows in the middle). 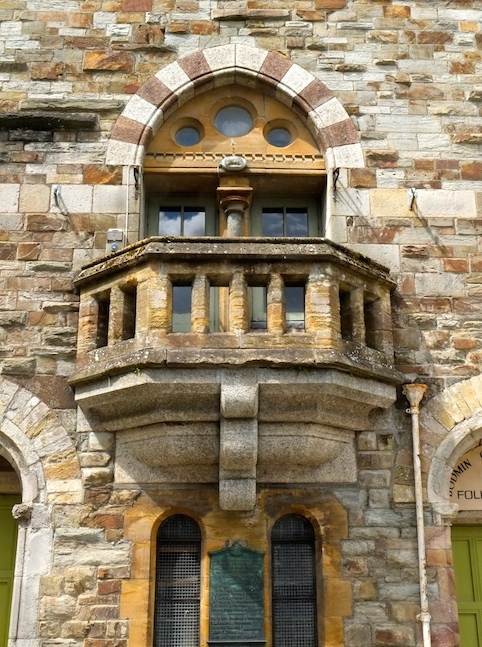 One end has an oriel window, the other a stone balcony above a pair of narrow windows and below some plate tracery and a banded arch – there's a circular niche still higher up. There are further variations in the openings at the lowermost level, to take into account the sloping site. 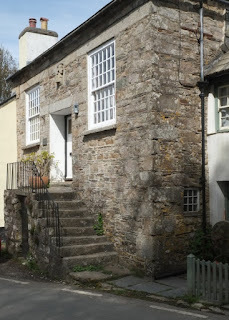 You can see, in this interesting facade, the West Country architects, Ralling and Tonar of Exeter, expressing the interior uses of the building (part hall for meetings and shows, plus a smaller hall, service rooms, and a museum on the lower ground floor) and flexing their muscles stylistically. It’s 1891. Architects in London such as Norman Shaw have been developing free Tudor and ‘Queen Anne’ styles for some time. Building styles are getting freer in all kinds of ways. But the builders of Bodmin had another card up their sleeve that was lacking in leafy Queen Anne suburbs like London’s brick-built Bedford Park. Stone. Lots of it, in great variety of colour and texture. Quite a lot of it is slatestone or killas, a local stone much used in Bodmin; there is also another local stone, elvan. These account for much of the multi-coloured grey to russet walls. There are also granite and Ham stone dressings. Put together, this mix makes for a shimmering fabric that reveals its full beauty in sunlight but is impressive on a cloudy day too. I’ve been looking at a lot of church woodwork recently, cricking my neck to examine carved angels in roofs, and clicking my knees to get down and peer at the images on bench ends. I’ve been struck, as I’ve done this, by the variety of musical instruments being played, especially by carved angels (there were far more than harps in medieval heaven, clearly), and down on ground level too. Altarnun’s superb set of bench ends features a couple of musicians, one playing some kind of fiddle, and this bagpiper, who gives a fair indication of the folkish nature of the art, and also, presumably, of the music to be heard hereabouts in the late Middle Ages, when these bench ends were carved. In the United Kingdom we tend to think of bagpipes as Scottish. The Scottish pipes skirl in military parades, at royal occasions, and I’ve even seen buskers, wearing the kilt and taking the chance with their pipes on the streets of London. We should know better, of course, than to think the Scots have the monopoly. There are Irish pipes, Northumbrian small pipes, all kinds of bagpipes. They’re all over Europe too. I was thrilled during my travels in Central Europe to find the bagpiping centre of Strakonice in the Czech Republic. And there is the opera Schwanda the Bagpiper,† and so on and on. There are plenty of references to early pipes and bagpipes in Cornwall, including a number of carvings in churches. These instruments are interesting in that, unlike many bagpipes, they have two chanters – the pipes with holes on which one plays the melody – which must open up harmonic possibilities denied to players of bagpipes with a single chanter. The carving of the figure is simple but bold, and it is badly worn. But one still gets an impression of the vigorous style – in the folds of the costume, the modelling of the bag, the extraordinary hat, even the little dog. John Betjeman said that a church should bring one to one’s knees. Peering at this bagpiper got me kneeling to look closely – not quite the kind of prayerful kneeling that Betjeman had in mind. But Betjeman also encouraged us all to use our eyes. And I’m glad I got down, and peered. * I am playing here on Dudelsack (the sack on which one tootles), the wonderful German word for bagpipes. † Švanda dudák in Czech, Schwanda der Dudelsackpfeiffer in German, by the composer Jaromir Weinberger and based on a play by the Czech writer Josef Kajetán Tyl. I visited Altarnun primarily to see the parish church (which is late-medieval, beautiful, and packed with interest, including an outstanding set of 16th-century bench ends that I'll post about soon), but also found this simple but interesting building. It’s a former chapel, and is small, with just two sash windows (6 x 6 panes) lighting the front wall of what was the main chapel and a low bottom storey that was originally given over to storage and stables. The most striking feature is a bust of John Wesley above the door. This bust is interesting for several reasons. It gives us a date, 1836, which is apparently the date of an extension to the building, not the year of its original construction: one should always beware of datestones. That date also caught my eye because of the lettering. The 3 and 6 take a rather odd form but the overall impression is emphatic and impactful. More memorable is the carving of the founder of Methodism, shown in profile and sticking well out, so that it’s not so much a relief as three-quarters of a bust. The sculptor was Neville Northey Burnard, who was born in one of the adjoining houses, carved the bust when he was 16, and went on to work widely in London as well as in his home county. The carving has a vigour that helps to explain how Burnard became a successful portrait sculptor – although the success didn’t last because he turned to drink after the death of his daughter, and went into a decline, living for years as a tramp. It’s good so see his early portrait of Wesley, remaining in place even after the chapel it adorns has been converted for residential use. The volumes in the Buildings of England series, written originally by Nikolaus Pevsner and added to and revised by later scholars, are invaluable, one of the greatest works of cultural history and commentary ever produced. The recent edition of the Cornwall volume (a revision and expansion by Peter Beacham of the very first volume in the series, issued originally in 1951) is exemplary: packed with information, building on the original work, fillings gaps in it, updating it, and adding something of its own: a real sense of Cornwall as a distinctive place. And yet sometimes, in towns especially, I like to wander without Pevsner in my hand, noticing things for myself, and occasionally missing things of course, and seeing what my own eyes lead me to. So it was that I stood and admired this small stone plaque in High Street, Launceston, boggling that it was just plonked there, apparently (with a later bit of shop front plonked in turn over part of the left-hand scroll). An angel playing the lute while another helpfully holds a scroll bearing a stave. What religious purpose could this angel-adorned building have had? I looked, admired the carved faces and feathery wings, tried unsuccessfully to work out whether there was any actual music on the stave, photographed the curiosity and walked on. Round the corner in Church Street, finding a full blown and very architectural shop front, I dug out Pevsner from my bag and read the details. A shop of c. 1870, designed by James Hine in a sophisticated Italianate style as – the inscription makes it clear – Hayman’s Pianoforte Warehouse. That inscription is a striking piece of work, as are the front’s arches, keystones, capitals, and other details, though I was prevented from taking satisfactory pictures by the presence of a large van that was parked there, very close to the facade, for the whole of my time in the town. Pevsner, what’s more, explains that Hayman’s premises went right through to the High Street, where there’s a relief of angel musicians. Mystery solved. The angels don’t signpost a religious building at all. Like the wonderful lettering on the shop front, they advertise a business where the Victorians could buy pianos (grand or upright, depending on budget and available space) and no doubt harps too and perhaps even lutes (although 1870 is rather early for the early music revival). Advertising built to last. Postscript Having years ago written about another musical building adorned with angels – or with putti at least – I should have known. London's Maida Vale underground station celebrates its one hundredth birthday today, Saturday 6 June 2015. It's one of the many stations designed in the style developed by Leslie Green, the Underground's short-lived architect of the first years of the 20th century. The trademark manner that Green developed became a kind of three-dimensional corporate identity for the capital's underground railway. It's not just the familiar oxblood tiles, but so many of the other details – segmental arches, ornate glazing bars, signs made up of big tiles containing one or sometimes two individual letters each, the flat roof designed to accommodate development above if desired – that make these station instantly recognisable. And of course the Underground roundel. Maida Vale has a particularly decorative glittering mosaic version of this inside the station, which I've posted about before. This station's other claim to fame is that when it opened it was staffed entirely by women – apparently it was the first tube station to have an all-female staff. This was no doubt a result of the way in which World War I was draining potential male staff members away at a rapid rate, bringing many women into waged employment for the first time. Thoughts of the war provoke mixed feelings, then, but the architecture and its survival are something, at least, to be thankful for. Ian Visits has more about the station here. It’s a favourite landmark of mine, the Bliss Tweed Mill, on the edge of Chipping Norton. I’ve been past it so many times I’m no longer shocked by its bizarre but rather wonderful architecture – like an Italianate country house of the 1870s, mostly, but with its chimney rising through a central circular tower and dome. The architect was George Woodhouse and he built the mill, indeed in the 1870s, for Bliss and Sons and succeeded in giving it a palatial look in its crease of the landscape in the Oxfordshire Cotswolds. With its square corner towers it looks like a big house by an architect like Barry, but inside there are cast-iron columns, just as you’d expect in a Victorian mill.